Today's home tour is a double whammy; it's one of my absolute favourite homes (that I think you'll all love too!) but with a festive touch. So if you're looking for some Christmas decor inspiration, then keep on reading. 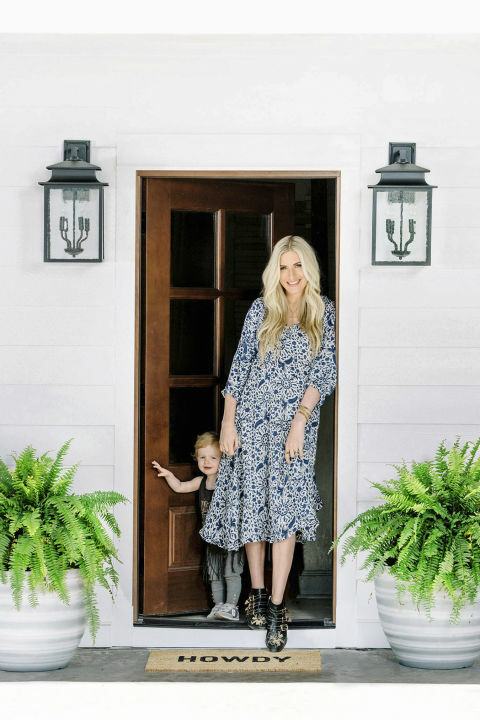 This is the Tennessee home of musician and entrepreneur Holly Williams- granddaughter of country music legend Hank Sr., daughter of Hank Jnr., and owner of the popular Nashville stores H. Audrey and White's Mercantile. The latter being one of my favourite shops that I haven't actually been in yet. Keep reading to see what the first thing I'll buy when I get there will be, It'll also be the first thing you see when you come to my house. Photos by Leslee Mitchell and Annie Schlechter. Holly has a knack for finding the perfect materials to fit the period of the home, but still feel contemporary. The fabric used for the blinds is 'Baris' by Duralee. The cabinets- a combination of glass-fronted, solid lower units and open shelving- is just hodgepodge enough to look like it could be original to the house. "I fell in love with the home's old fireplace the moment I walked in. The brick is perfectly worn, and I love how it seperates the room but still leaves plenty of space for flow around it." says Holly. The warm tones of the furniture and pattern of the rug ground the white, airy space. Again, there's a lot of white in this space, but the china blue painted floors and personal knick-knacks add colour. But the real secret is that the white is heavily textured- the armoire is chipped and the walls are shiplapped. Every creative needs an in-bedroom writing nook for those middle-of-the-night ideas you're too wired to sleep on but too tired to leave the room to work on. Despite the fact that this fireplace doesn't work (and costs too much to fix! ), Holly has created a cosy seating area around it. It looks warm-- it just mightn't feel warm. Oh well, you can't have everything! The paintings above the fireplace are by Holly's artist husband, Chris Coleman. The pattern of the china blue curtains is Night Vine by Diane Von Furstenberg's collection at The Shade Store. I feel like this room makes a good case for painting your ceiling the same colour as your walls. In this case, that colour is the perennial Farrow and Ball favourite, Downpipe. The perfect solution for that awkward under-the-stairs spot. All I want for Christmas is a Brockway sink like this one. Reckon it'll fit down the chimney? Floral wallpaper, patterned tiles and a dark painted ceiling are daring choices singularly, much less when they're executed together. But I think the risk paid off. "Some people like to watch TV or get on Facebook. I like to look at wall coverings," admits Holly. "It's a high-impact way to add personality to a space." Although the wallpaper in the hallway is heavily patterned, its blue and green tones keep it from looking too fussy and twee. Had the colourway been in pinks and reds, it would've given the space a very different feel. This particular pattern is 'Delft' by Designers Guild in 'Seraphina'. You see that HOWDY doormat? When I get to Holly's shop, White's Mercantile, that's one of the things that's on my shopping list. And you see that porch swing, and those rocking chairs? I'm gonna have them in my future house too. I can just picture it now "Night Louise", "Night Jim-Bob...". Quotes from Holly first appeared in Country Living magazine.